The whitetail deer's long white tail, raised erect when alarmed, is its most distinctive feature. Its metatarsal gland below the hock on the outside of the hind leg is one inch long, which is somewhat shorter than its cousins the mule deer and the blacktail deer. Whitetail fawns are spotted at birth. As adults, their color varies form a summer reddish-brown to a winter gray. An adult whitetail buck can weigh anywhere form 200-400 pounds, depending on the area of North America. Whitetails are browsers, therefore they may be maintained on marginal land unsuitable for cattle, sheep and horses. They require little more than natural cover, browse, graze and nutritional supplements along with adequate water supply. Minerals and proteins are important in the deer diet; soil sampling and pasture management are fundamental tools for deer management. If the pasture does not supply enough nutrients, the farmer should supplement feed with trace minerals if needed. Whitetail deer need hay, grain, vitamins and minerals during the winter to meet nutritional requirements. Supplemental feeding is also necessary during hot weather when pastures are growing slowly and during late summer in preparation for the rut. Whitetail deer are hardy animals, but are vulnerable to diseases that afflict other cervids. They are also susceptible to Epizootic hemorrhagic disease, bluetongue and anaplasmosis. Sheep should not be raised side by side with whitetail deer as they are carriers of bluetongue. Whitetail deer follow the patterns of their cervid counterparts in reproduction stages. Unlike red and fallow deer though, twins are regularity. They have seasonal synchronization of birth, body growth, activity cycles and growth stasis corresponding to feed quantity, quality and availability. For example, maximum nutritional demands for females occurs during lactation. The precise timing of breeding and birthing ensures that maximal lactational demands coincide with the most lush and plentiful growth of forage (May, June and July). Summer is the time of fawning and lactation, and the time of maximum weight gain for the yearlings. For the mature bucks, it is the time for antler growth and regaining of body condition and fat reserves depleted during the previous autumn rut and winter. Whitetail does have been known to live up to twenty years, producing fawns almost every year after two years of age. Does can be bred at one and a half years of age and up. The average productive life of a doe is ten years. 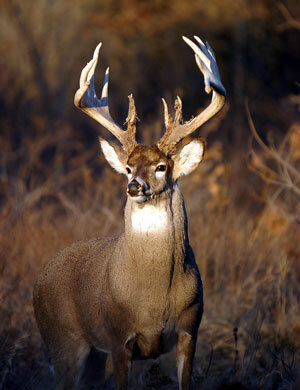 The current production practice is to replace bucks after five years of breeding. The ratio of buck to breeding does should be one to ten. Some whitetail breeders are currently using cutting edge technology such as artificial insemination, in-vitro fertilization, and selective breeding in their breeding program. This is also an excellent opportunity to learn new techniques such as chemical immobilization of deer, handling and transport. From a commercial standpoint, the whitetail segment of the deer industry is still in its early stages with potential for successful business ventures in all aspects, large or small.